The Mega-Sena created the largest jackpot ever in South America – a whopping £67 million in 2014. The draw takes place every Wednesday and Saturday and you can bet on the outcome for the same prizes at Lottoland. How does betting on the Mega-Sena at Lottoland work? Instead of entering the official Mega-Sena lottery draw, you place a bet on the outcome and the results of it can be found here. You pick the numbers you think will be drawn in the same way as if you had entered the official lottery draw. Betting with us, you win the amount that you would have won if the official prize fund was shared between you and any official lottery winners. To place a bet on this draw select 6 numbers from the main pool of 1–60. You can also select the QuickPick option (Quick+1) and this will choose the numbers for you. After this simply click submit. This will take you through to a checkout. At this stage just click ‘Confirm and proceed’ to place your bet. You will win our jackpot if your 6 main numbers and bonus number is the same as that in the official Mega Sena draw. A single line costs £1.50. A line with the DoubleJackpot feature costs £3. The DoubleJackpot feature allows you to bet for twice the official lottery jackpot. So, for instance, if the official Mega-Sena draw is £10m and you bet on the outcome with us and activate the DoubleJackpot feature, you can potentially win £20m. The prizes for all other tiers will remain the same. You will pay double the price of your normal line to activate the DoubleJackpot feature. So, if you wish to bet on Mega-Sena with the DoubleJackpot feature you’ll pay £3, instead of £1.50. The Mega-Sena draw takes place every Wednesday and Saturday at around 10pm GMT. The odds of winning the jackpot are 1 in 50,063,860. A breakdown of all the odds for each prize tier, together with estimated returns is included below. When you bet on the outcome of the Mega-Sena, Betting with us, you win the amount that you would have won if the official prize fund was shared between you and any official lottery winners. The table below explains the different prize tiers, odds of winning each prize tier and the estimated individual returns for each prize tier. The information below is provided as a guide only. Should you win you will be paid out in pounds. The values shown are in pound sterling. Please bear in mind that the values shown are dependent on the euro to pound exchange rate. The average prize amount is based on the results of the Saturday March 05th 2016 draw. Why should I bet on Mega-Sena at Lottoland? The Mega-Sena costs just £1.50 to bet and offers great odds of winning the jackpot compared to some of Europe’s biggest draws. 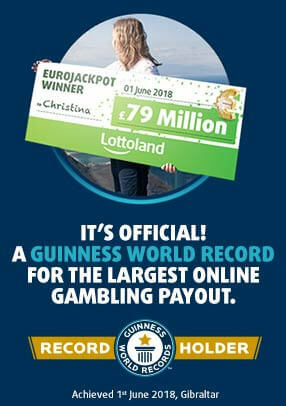 The jackpots can also become very big, with a record South American jackpot of £67m recorded in 2014.